The most drastic thing to change my training and physical development in the last two years has been a focused and consistent look at nutrition, and then using that knowledge to make daily choices. Different body types have different requirements. I am that person who rages when the school lunch lady won’t let you get a potato with your meal because “too many people are obese.” I can’t stand seeing only low fat yogurt in the grocery store and often buy baby yogurt because it’s the healthiest. I actually have some opinions on the effectiveness of no calorie and reduced nutrition foods even for people trying to lose weight. But for ectomorphs like me, high metabolism freaks of nature, every calorie is like gold! When I try to push my daily intake to a level that will increase size and muscle mass I quickly see that it is a daunting, expensive, time consuming challenge. I find myself saying, “700 calories? Great give me two.” While overall caloric goals can be approached by breaking eating up into 4-6 meals a day, what makes up those calories does matter also. The program I have followed and developed over the last couple of years is something I plan on teaching soon and sharing with others because there’s just not enough good information out there for skinny martial artists who want to retain lightning fast speed while gaining effective muscle strength and size. I use the word effective because of the criticism people often levy against resistance training. Folks say, “The size you gain from weightlifting is useless, prone to damage, and not truly efficient.” Of course that’s mostly a load of crap based on a few poor examples. Having your vital organs and bones on the surface of your skin is never favorable when someone is trying to poke, punch, kick, grab, jab, or otherwise cease your mobility. Muscle is armor, in addition to strength. And while one can slip out of balance, proper muscular development and tone is vital for optimum performance in any physical endeavor. It’s paramount that the muscular development be brought into a mold that mimics the requirements of a given field, and that’s where my program comes in – but that’s not what this short writing is about! It’s about an easy meal you can fix yourself that covers a lot of bases. Time is precious for most of us. For most guys learning to cook is really a matter of impressing some girl, or girls, women, whatever. I mean we like good food, but a pot of mac and tuna does just fine at getting us full. A little salad answers the persistent voice of mom. Broccoli has some complex carbs, and we want strength and energy and to not burn existing muscle, so we steam that. Besides broccoli can have butter and a little cheese. Mmmmm. Cheese. So what is it we are looking for? We want a food that isn’t too expensive, doesn’t get old fast and isn’t too exotic to enjoy over and over again. It should be capable of slight changes in flavor, have some vegetable element, carbs, healthy fats, and a GORGE of protein. Omega stuff, calcium, and be able to last all day without going bad or getting gross. There’s more; it should be portable. Bonus if we can throw it in a bag or box and eat on it all day. Add a few little staples like rice, noodles, bread, or whatever you want and this precious food source can become a meal. Add alfredo sauce and wine and you can impress your girlfriend. Or friends. Whatever! 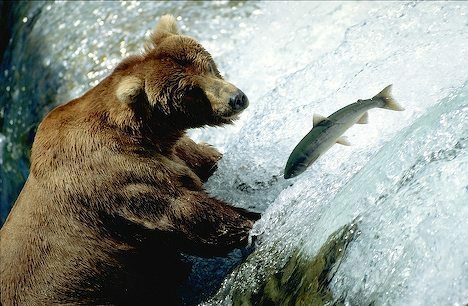 Enter Salmon. Wild caught Alaskan Salmon to be precise. I remember when it was like a buck per can, I bought at least 50 cans for my Y2K stash. It was a good investment. In fact I still stock up on salmon from time to time. Note that the farmed salmon (often called natural) is colored with weird stuff you don’t want. The wild stuff sells for around $3 a can and can be eaten right out of the can if you can stay in true bachelor mode. We got this in the can. Add a bagel and we’re done. 79 grams of protein. But that doesn’t fit the bill as mentioned above. RECIPE: Ok, drain the can of salmon and dump the whole thing into a medium to large bowl. Add a raw egg and crush a few handfuls of saltine crackers (or substitute of your choice), add those. Now dice a small onion, put it in with a few pinches of cayenne or other hot sauce, Curry is great! A pinch of Cinnamon can round of the flavor and add some nice anti-oxidants. Mix well. Crush the bones with a fork if you don’t like them, or if you are fixing this for your girlfriend or whatever. I’ve tried substituting everything for the crackers; corn meal, oat meal, crushed acorns, cereal, unknown dry substances in my pantry. In the woods this is where you add bugs and berries but that’s a different article I think. The onions are critical and sweeten the mix. Anyway, form the congealed substance into a small ball and pat it out flat. Have hot oil ready to go in a pan and drop in the patties starting with a ring around the edge, add the center patty last. Some oils are better than others. In general, veggie oils produce the most poisonous heat related by-products, bacon grease handles high heat without oxidization, olive oil is in the middle, Coconut oil is superior. The center patty cooks extra fast on most eyes. I find the best texture happens with higher heat (Medium); crispy outside and tender but cooked inside. Rotate the ones on the outside of the pan because often only half of the patty gets well crisped. One can of salmon can make anywhere from 9 smaller patties to 5 or 6 large ones. But the fun is not over. Of course flip them at some point and place on a paper towel of you have one. The finished product is good ALL DAY, even overnight. Heck I’ve probably pushed the boundaries a little and eaten them many days later. All ingredients can be stored without electricity in a primitive environment – yes eggs stay good a long time outside the fridge, but if you have a water source you also have a good cooler. Plastic bags work but they are strange when it comes to moisture, and plastic breaks down into estrogen-like compounds, which for us guys is kind of the opposite of the whole goal here. That might explain a lot. In general strive for less plastic, dudes. The best non-impact resistant storage is a small box with patties wrapped in foil, cardboard ok. Reheating works well but they are great cold. Add granola, fruit, or rice and some sauce and you have a world class meal on-the-go. Getting back to weight gain; fix a load of these in the morning and eat between every meal all day. An evening dose of salmon helps keep the body from consuming itself in the early morning hours as you sleep. Let me rephrase clearly; it is not a meal, it is in addition to all other meals! Let me know how it goes! I have fun salmon stories, one of which being a trip to Jamaica where we had a delay and spent the night at the airport eating our box of patties all night, freezing cold, blowing a didjeridoo and looking weird in general. Bonus tip: If you eat the salmon within 45 minutes after a hard workout, the protein uptake in the muscle tissue is at its highest and will result in stronger synthesis if practiced as a routine habit. A good digestive system lengthens the window up to an hour and a half, poor systems need fixing but mean you should start eating as your sweat dries. The body should be hydrated from drinking water before and throughout the workout. Translation; eat salmon patties after training and get stronger. Drive on! Author Spencer Bolejack directs Land of the Sky Wilderness School in western North Carolina where he teaches martial arts from a variety of perspectives, systems, and schools.